As a conservation biologist I see ecovillages as an example for all of us. We need to reduce our impact on the Earth, and these communities are doing that well. This book looked like it would provide good examples to show my students how they could reduce their impact as well. However, I would have liked more detail to help others start their own community, or give people ideas for ways to reduce their individual impact on the Earth. 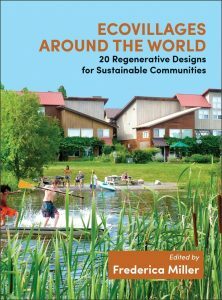 Ecovillages Around the World: 20 Regenerative Designs for Sustainable Communities edited by Frederica Miller is the fifth book in a series. Each of the four previous books focused on one of four keys to designing sustainable communities: social, ecological, economic, and worldview. This one includes examples of ecovillages that range from ones that are just developing to ones that have been around for decades, and from more typical community designs focused mostly on efficient housing to communities that include sustainable housing, shared spaces and vehicles, gardens, forests, and more. The book started with a description of what elements comprise an ecovillage and several pages dedicated to each community highlighting these same elements. Differences were observed between the communities. Each had their particular spiritual focus supporting their community. Many had shared economies, and some even had their own monetary system. The communities shared the common themes of having master plans to drive the community design, the desire to use more sustainable, and often low-cost, housing options. Many had shared items and spaces that not everyone needed to own individually, such as cars and kitchens. There were sustainable farming practices, sustainable waste disposal systems, and sustainable power generation was practiced. There was not much detail though for each community and how the people began their community with these systems. The book had the potential to show people how to create a sustainable community by providing more detail and highlighting the way the communities combined the four keys for sustainable design they mention. The four keys were not mentioned specifically in the sections on communities though, and the detail provided in each section was not enough to help people understand how to start their own ecovillage based on the examples of others. After the 20 ecovillage sections there is a section with the biographies for each person who wrote about one of the communities. This seemed out of place. At that point in the book I could not remember the details of the community each person came from to be able to place them in the life of that community. It would have been nice to have each of the author’s biographies with the section they wrote. Following the biographies is information on Gaia education. This also seemed out of place. Designing sustainable communities is part of this education, and there are specific programs for learning different elements, even ones that lead to graduate degrees. This focus on education at the end did not flow from the focus on the 20 ecovillages though. Overall, I thought the topic for the book was a great idea, and it had good potential, but it didn’t provide the information I expected to help others adopt more sustainable practices.